This bike is all original and un-restored. 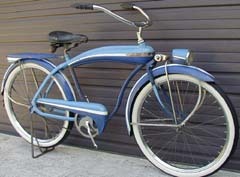 This bike was offered in this configuration only in 1941 by Firestone stores. It was manufactured by the Colson company. 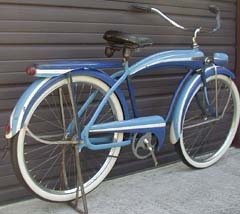 The “Super Cruiser” was equipped with a spring fork (the Colson Cushioner) and a tail light in the rear carrier. The standard “Cruiser” had no tail light and had a rigid fork and truss rods. The headlight on this bike is a Delta Roadlighter.